Why Support Inherited EM Research? The purpose is to create a patient registry and learn more about the cause, progression and underlying genetic basis of certain rare diseases – with a particular interest in EM patients/families who do not have the Nav 1.7 mutation. The purpose will be to study the functional impact of pediatric chronic pain on children, and their families. Focus will be on the impact of pain on school functioning, social functioning, psychological functioning and family functioning of pediatric chronic pain. 1. Families in which two or more individuals have EM in more than one generation (Inherited EM). 2. People with early-onset EM, i.e., individuals with EM whose symptoms developed during their first 10-15 years of life. 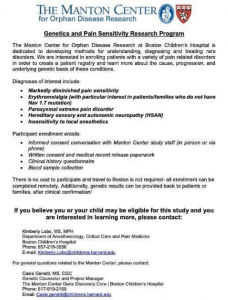 Individuals with inherited EM or early-onset EM who meet the above stated criteria, and are interested in volunteering in our research, may contact us at: neuropathicpain@yale.edu. Please note that the profiling DNA from the above two groups of EM sufferers is part of the research program at Yale. Because this is a research program and not a clinical service, Yale is prohibited from disclosing the results of DNA profiling to patients. DNA profiling is very effort-intensive and therefore, Yale is unable to study patients with non-inherited EM and patients with adult-onset EM at this time. Copyright © The Erythromelalgia Association. All rights reserved.